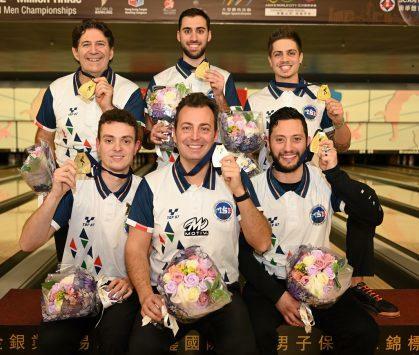 HONG KONG - Prior to the 2018 World Bowling Men's Championships, Italy only had made one previous appearance on the event's medal stand, and that was nearly 50 years ago. That changed Tuesday as Italy upset the United States, the defending champion in the five-player team event, 2-0 in the best-of-three Baker format, to win the coveted title at the South China Athletic Association Bowling Centre. In Baker competition, each team member bowls two frames of each game. The leadoff bowler bowls the first and sixth frames, the second bowler takes the second and seventh frames and so on. In wins of 189-169 and 210-166, Italy benefited from Team USA's spare-shooting miscues and stayed calm and clean in the deciding game to earn its place in World Championships history. Italy earned a bronze medal in the five-player team event at the 1971 tournament in Milwaukee. This year's roster included Marco Reviglio, Pierpaolo De Filippi, Erik Davolio, Nicola Pongolini, anchor Antonino Fiorentino and Marco Parapini. "This is a dream come true," Fiorentino said. "We live and bowl for these moments, and it's so incredible. We bowled against two of the best teams in the world. After finishing 22nd last year in Las Vegas, we put in a lot of work to be ready for this year. The lanes were tough tonight, but we managed to keep ourselves calm. We made good shots and left easy spares. This means so much to our country." Entering this year's event, Fiorentino recognized the Team USA squad as a "dream team" - one of the strongest groups the United States has fielded, if not the best. This year's team included recently named Chris Schenkel Professional Bowlers Association Player of the Year Andrew Anderson, Chris Barnes, Jakob Butturff, Tommy Jones, EJ Tackett and Kyle Troup. All six are PBA Tour champions, while Barnes, Jones and Tackett each have been the PBA Player of the Year. "The guys bowled really well the first match and put us in position by making it to the title match," Team USA coach Rod Ross said. "We made some mistakes and errors in critical situations, and Italy capitalized on it. 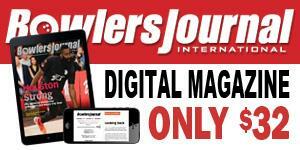 They bowled extremely well and put it out of reach, and we couldn't catch them." Team USA has finished among the top two in the World Championships team event nine consecutive times, including gold medals in 2006, 2008, 2010 and 2017. Additional wins came in 1963 and 1971. Jones and Barnes have been part of each performance since 2008 and were joined at the top of the medal stand last year in Las Vegas by Butturff, who was making his World Championships debut. This year, Anderson, Tackett and Troup all were first-time participants. Two missed spares, a 2-8 combination and a 6-10, in the opening game against Italy halted any momentum Team USA had after easing past Singapore in the night's first semifinal. Despite the mistakes, though, Jones had a chance to shut out Italy with a double and seven pins in the 10th frame, but a 4-6-7-10 split on his first offering handed the game to the Italians. Italy started the second game with a double and five consecutive spares to pull away. The gold medalists solidified their spot among the top four after six games of qualifying by closing with a 1,044 game, which put them two pins ahead of fourth-seeded Singapore and 19 pins ahead of Indonesia, the first team out of the cut. Italy earned its meeting with Team USA by defeating Canada in the Tuesday's second semifinal, 2-1 (176-162, 210-244, 190-179). In the best-of-three format, teams alternate lanes each game, with the higher seed determining the initial starting lanes. Canada entered the medal round as the No. 2 seed, and Italy was No. 3. All three games were won by the team on the right lane. In the opening game, Canada opened twice and failed to strike in the second half game, allowing Italy to rally with strikes in the eighth, ninth and 10th frames to earn a come-from-behind victory. The Canadians regained their momentum in Game 2, but managed only two strikes in the finale. A missed 2-4-10 split by anchor Dan MacLelland in the 10th frame meant Fiorentino needed just four pins to advance. In the first semifinal, Team USA struck 14 times and defeated Singapore, 2-0 (238-194 and 216-189). Singapore threw only two doubles in the match, and both came in the 10th frame. Canada and Singapore each received bronze medals, marking the first time either had medaled in the five-player event at the World Championships. The silver medal was the seventh for the United States at the World Championships. Competition at the SCAA Bowling Centre resumes Wednesday afternoon with the second round of Masters match play. Only 16 players remain in contention. That includes the top eight from the week's all-events standings, who had first-round byes, and the eight winners from Tuesday's first round, which featured the No. 9-24 players from the all-events standings. The tournament will end Wednesday with the Masters medal round, scheduled for 3 p.m. local time (2 a.m. Eastern). All 265 competitors at the 2018 World Men's Championships bowled 24 games this week (six games in singles, doubles, trios, team), and medals also were awarded for all-events. There will be gold, silver and two bronze medals up for grabs in the Masters competition. Singles and doubles both were won by Malaysia, Team USA's Anderson, Tackett and Troup took the trios gold medal and Tackett added the all-events gold to his haul. All qualifying rounds at the 2018 World Men's Championships are being livestreamed by World Bowling, and all medal rounds will be broadcast to the United States and Canada by FloBowling. A FloBowling subscription will be required to watch the medal rounds.